Noel Kelly's Kids - Arncliffe Scots 1969 Un-Defeated Premiers ARNCLIFFE SCOTS 1969 “E” GRADE UN-DEFEATED PREMIERS Lets turn the hands of time back 40 years to 1969. Have a look at these good looking young men…This team photo was taken near the Arncliffe Scots club at the end of a very long season. The year was 1969. Most of us played for our schools (Kogarah High, Marist Bros Kogarah and Christen Brothers Lewisham etc) during the week as well as Scots on the weekend. When you are 16 we would of played 10 times a week, we loved the game. K.SuttonSelectorP.ByrnesB.MielnikC.BramleyV.Bramley CoachS.ButlerP.ByrnesT.MelvilleB.TaskerManger D.PriceJ.MiezerB.HaynesCaptainP.FrancisB.StarkeyT.Lewis M.PascoeS.ClaggettG.ClaggettBallboyW.TaylorW.MeredithB.SuttonVice Captain It only seems like last week but it is 40 years ago that I was lucky enough to play in a team that went though the whole season undefeated. We played 5 preseason games and won the couple that were not abandon due to fights. Won all 12 games during the season plus the Semi –Final and Final also 2 games against a Queanbeyan team and 1 game against Gilgandra.Have a look at the team record below…only 11 tries scored against us all season…all through the forwards of course!! TEAM RECORD Round 1 12.4.69 Defeated De La Salle, Kingsgrove 12 to 5 20.4.69 “ Oatley R.S.L. 12 to 2 27.4.69 “ Kingsgrove Colts 8 to 7 03.5.69 “ Peakhurst Hawkes 10 to 5 17.5.69 “ Bexley-Kingsgrove 19 to 0 25.5.69 “ Penshurst R.S.L. 7 to 2 Round 2 31.5.69 Defeated De La Salle, Kingsgrove 18 to 2 07.6.69 “ Oatley R.S.L. 11 to 2 28.6.69 “ Kingsgrove Colts 12 to 5 05.7.69 “ Peakhurst Hawkes 19 to 6 26.7.69 “ Bexley-Kingsgrove 30 to 0 02.8.69 “ Penshurst R.S.L 16 to 0 Semi- Final 9.8.69 Defeated Penshurst R.S.L. 6 to 2 FINAL 27.8.69 Defeated Kingsgrove Colts 14 to 8 ------------------------------------------------------------------------------------------- PERFECTION PLATE- TROPHY 16.6.69 Defeated Queanbeyan 13 to 5 209.69 Defeated Queanbeyan 19 to 5 CHALLENGE MATCH 31.8.69 Defeated Gilgandra 10 to 3 Col Bramley (he played five eighth) came up with the good idea to have a forty-year reunion and also celebrate the coach’s 80th birthday. It was a great day and a chance to catch up with some blokes that I had not seen for nearly 40 years. 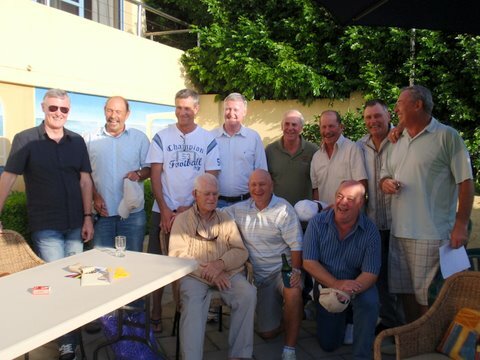 The Boys today with the Coach(Hats On) Peter Byrnes ,Bruce Mielnik, Col Bramley, Paul Byrnes, Jeff Miezer ,Tony Lewis, Bruce Starkey ,Bruce Haynes. 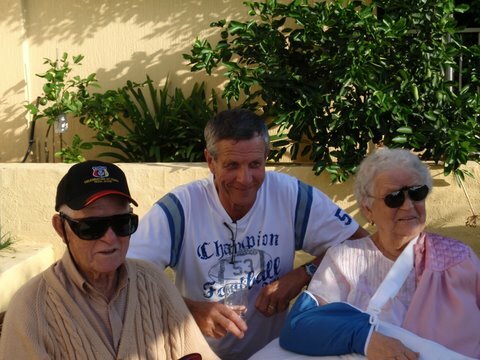 Vic Bramley (Coach) Wayne Meredith, Wayne Taylor (Hats Off) Mr and Mrs Bramley with son Col in the middle. Vic Bramley “The Coach” Not a bad team two of the Arncliffe Scots 1969 E grade boys made it. Bruce Starkey and Stephen Butler 1977 was the famous drawn Grand Final with Parramatta.Bruce and Stephen played in both games.St George won the replay 22-0 footnote. Ken Boothroyd the Saints trainer was my sprint trainer at school. Lets turn the hands of time back 40 years to 1969. This team photo was taken near the Arncliffe Scots club at the end of a very long season. Most of us played for our schools (Kogarah High, Marist Bros Kogarah and Christen Brothers Lewisham etc) during the week as well as Scots on the weekend. When you are 16 we would of played 10 times a week, we loved the game. It only seems like last week but it is 40 years ago that I was lucky enough to play in a team that went though the whole season undefeated. We played 5 preseason games and won the couple that were not abandon due to fights. Won all 12 games during the season plus the Semi –Final and Final also 2 games against a Queanbeyan team and 1 game against Gilgandra. Have a look at the team record below…only 11 tries scored against us all season…all through the forwards of course!! Col Bramley (he played five eighth) came up with the good idea to have a forty-year reunion and also celebrate the coach’s 80th birthday. 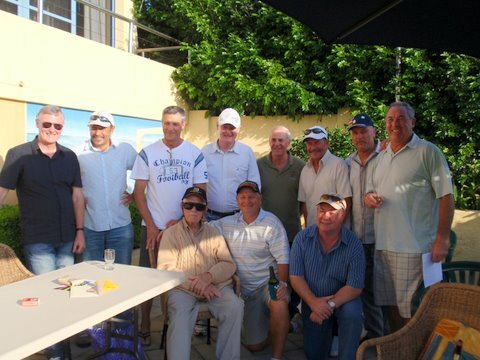 It was a great day and a chance to catch up with some blokes that I had not seen for nearly 40 years. Mr and Mrs Bramley with son Col in the middle. Not a bad team two of the Arncliffe Scots 1969 E grade boys made it. 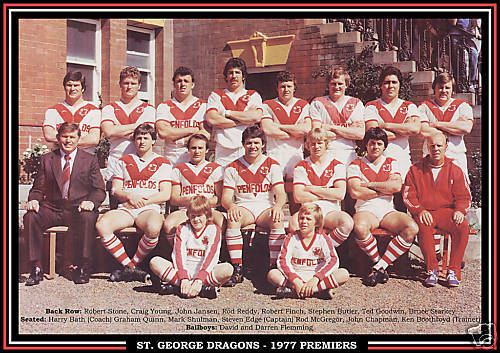 1977 was the famous drawn Grand Final with Parramatta. Bruce and Stephen played in both games. footnote. 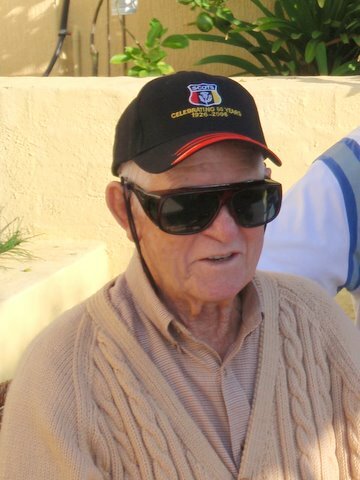 Ken Boothroyd the Saints trainer was my sprint trainer at school.